Premium aftermarket brake manufacturer, Mintex, has turned an old Austin J40 into a miniature pick up version of its iconic 1939 Morris Z Series E Van, which will lead young racing enthusiasts out on to the track during this year’s Goodwood Revival Settrington Cup. The scrap metal from an existing but very dilapidated J40 was cut in half and the wheelbase was extended by 25 centimetres to allow for the pick-up back to be fitted. The car was revamped with new upholstery and chrome bumpers, as well as utilising the original rear-wheel arches on the pick-up section. 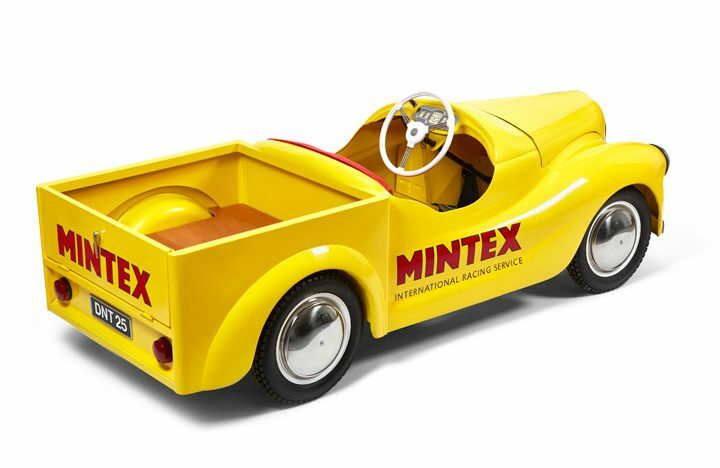 Braked with a bespoke friction material, Mintex has not only created a show-stopping vehicle but has potentially solved a sourcing issue for other J40 owners as a replacement brake lining for the J40 was a problem for pedal car owners to find. The Settrington Cup will take place on Saturday 10th September and Sunday 11th September and caters exclusively for the J40 Roadster. A rare marque, the pedal car replicates Mintex’s 1939 Morris Z Series E Van which will also be at this year’s event. Roy Halford, supplier of reproduction parts for Austin J40s and Pathfinder pedal cars, added: “When Mintex got in touch during the build of their Austin J40 it was interesting to hear about the friction technology that they had available. Mintex will be officially launching its Classic range at Goodwood Revival this September with a selection of the products available to buy at the event. The range will also be sold online and distributed by Questmead, expert manufacturer and distributor of specialist racing products for the classic market.